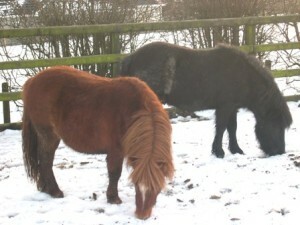 Shetland ponies may be any colour known in horses except spotted. The coat changes according to the seasons: a double coat in winter with guard hairs which shed the rain and keep the pony's skin completely dry in the worst of the weather and, by contrast, a short summer coat which should carry a beautiful silky sheen. At all times the mane and tail hair should be long, straight and profuse and the feathering of the fetlocks straight and silky. The head should be small, carried well and in proportion. Ears should be small and erect, wide set but pointing well forward. Forehead should be broad with bold, dark, intelligent eyes. Muzzle must be broad with nostrils wide and open. Teeth and jaw must be correct. The neck should be properly set onto the shoulder, which in turn should be sloping, not upright, and end in a well defined wither. The body should be strong, with plenty of heart room, well sprung ribs, the loin strong and muscular. The quarters should be broad and long with the tail set well up on them. Should be well placed with sufficient good, flat bone. Strong forearm. Short balanced cannon bone. Springy pasterns. The thighs should be strong and muscular with well-shaped strong hocks, neither hooky nor too straight. When viewed from behind, the hindlegs should not be set too widely apart, nor should the hocks be turned in. Tough, round and well shaped - not too short, narrow, contracted or thin. Straight, free action using every joint. Tracking up well. A most salient and essential feature of the Shetland pony is its general air of vitality (presence), stamina and robustness.